We are developing technologies that make use of biomass in a bid to reduce greenhouse gas emissions. Biomass is a generic term for plant and animal-derived organic resources*1 (excluding fossil resources) that can be recycled into energy or material. Burning biomass releases CO2, but CO2 absorbed from the atmosphere by plants during photosynthesis offsets this release. This is the greatest advantage of using biomass. It can be used as an energy source in a number of ways, such as obtaining heat or electricity with the use of steam generated by burning it, and using biogas acquired from fermented biomass for combined heat and power (CHP) systems*2. We plan to promote the wider use of biomass and its diffusion by working on the biogas utilization technologies we have developed through combustion of city gas and biogas as well as technologies for extracting biogas through more reasonable and efficient methane fermentation of biomass, such as food waste, and upgrading biogas to a higher quality gas. *1 Examples are rice straw, farm, forestry and fishery products like livestock excrement, food waste, sewage sludge and wood chips. *2 Gas engine-based CHP systems generate electricity and recover waste heat generated as a by-product. The Tokyo Gas Group possesses technologies for converting biomass such as food waste and sewage sludge into gas for use as fuel for boilers and power generation and uses biogas that builds up at customer sites mainly as fuel for cogeneration equipment. As biogas is a lean fuel comprising about 60% of CH4 and 40% of CO2, specific power generators are needed. 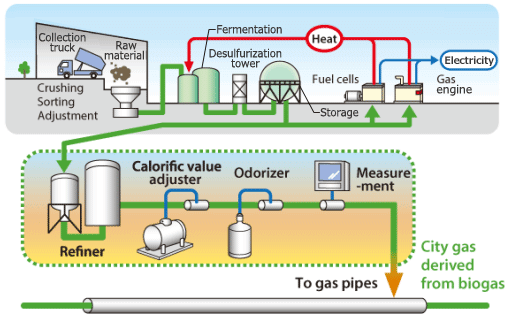 We were the first in Japan to begin to refine biogas from food waste, adjust its calorific value and odorize it so that it could be injected into city gas pipelines. In fiscal 2017, we received 485 thousand m3 of biogas derived from food waste (equivalent to about an 827-ton reduction in CO2 emissions). We have been carrying out joint research with the city of Yokohama since fiscal 2013 on ways to expand the use of biogas from sludge at a sewerage facility in northern Yokohama. We set up test equipment for refining biogas at the North Yokohama Sludge Recycling Center and are developing technologies for removing CO2 in sewage sludge biogas using a separation membrane to concentrate methane. We construct and operate hydrogen stations to popularize fuel cell vehicles (FCVs) and help establish the infrastructure for supplying hydrogen. We want to create a hydrogen society that makes use of zero-emission hydrogen energy. CO2 emissions for which FCVs are liable do not differ significantly from those for electric vehicles in terms of mileage, and the use of FCVs helps to reduce environmental impact. Japan’s energy self-sufficiency rate stood at only 8.4%*1 in 2016, a relatively low international ranking. The nation is often affected by international developments because of its dependency on fossil fuels imported from abroad for power generation. Since burning such fuels produces a significant amount of CO2, energy diversification is required. The Japanese government is pursuing the goal of putting about 800,000 FCVs into use and establishing roughly 900 hydrogen stations by 2030. As of the end of January 2018, about 2,400 FCVs were in use and around 101 hydrogen stations were in operation. 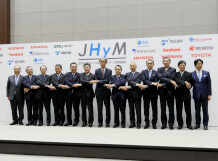 In February 2018, we jointly established Japan H2 mobility, LLC (JHyM) with 10 other companies*2, including infrastructure businesses, automobile makers, financial investors and other companies, to accelerate the pace of developing hydrogen stations. The world’s first collaboration of this kind will pursue an initiative for the strategic development and efficient operation of hydrogen stations. The objective is to establish a virtuous circle between FCVs and hydrogen stations, that is, increasing convenience for FCV users, boosting the number of FCVs, making hydrogen stations business profitable and building more hydrogen stations. Tokyo Gas will construct and operate hydrogen stations as an infrastructure company in collaboration with JHyM. Looking ahead, we will continue to pursue efforts to create a sustainable hydrogen society in collaboration with other companies. *2 Three automobile makers: Toyota Motor Corporation, Nissan Motor Co. Ltd. and Honda Motor Co. Ltd.; five infrastructure businesses: JXTG Nippon Oil & Energy Corporation, Idemitsu Kosan Co. Ltd., Iwatani Corporation, Toho Gas Co. Ltd. and Air Liquide Japan Ltd.; and two others including financial investors: trading company Toyota Tsusho Corporation and financial firm Development Bank of Japan Inc.
*3 Hydrogen stations supply hydrogen produced on location from city gas (on-site method) or hydrogen produced elsewhere (off-site method). Tokyo Gas produces hydrogen through the conversion of city gas, which emits only a limited amount of CO2 and has a low impact on the environment. *A device for cooling hydrogen to prevent the temperature in an FCV fuel tank from rising during refueling. 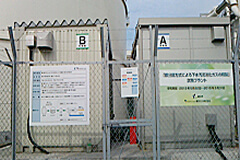 Tokyo Gas conducted research and development on hydrogen stations for supplying hydrogen to fuel cell vehicles as a participant in a New Energy and Industrial Technology Development Organization (NEDO) project on research and development of hydrogen utilization technology from fiscal 2013 to fiscal 2017. As NEDO is expected to carry this project forward, we will continue exploring ways to control the quality of hydrogen fuel injected into FCVs, assess the accuracy of hydrogen injection quantity measurement and inject hydrogen into FCVs other than passenger cars, such as buses and motorcycles. In addition, we will help formulate industry guidelines for these methods in the hope of incorporating them into international standards. We are further exploring efficient ways to run commercial hydrogen stations and reduce their maintenance costs. CHP systems boast significantly better power generation efficiency, approaching 50% for large-scale systems with an output of 5,000 kW or higher and exceeding 40% for medium-size systems with an output of 300 kW to 1,000 kW. This has resulted from technological development, such as the mirror cycle method*1 and fine, cylinder-wise control of combustion. 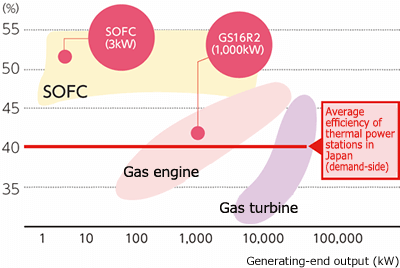 We improved the performance of the 1,000 kW-class GS16R2 CHP system, launched in fiscal 2014, and achieved a power generation efficiency of 42.5%, the highest for this class, as well as an overall efficiency of 80.1%. We rolled out the improved model in April 2017 and have benefited from a growing sales volume. CHP systems have raised customer expectations from the perspectives of eco-friendliness, energy conservation and business continuity planning, and they are predicted to be in wide use in line with improvements in economy and energy security. In the future, the use of solid oxide fuel cells (SOFCs) that operate in higher temperatures should realize even more efficient CHP systems. In partnership with manufacturers, we tested commercial SOFCs with an output of several to hundreds of kilowatts at the Senju Techno Station. By installing this equipment in facilities for different industries, we were able to assess their durability as well as their potential for saving energy and cutting CO2 emissions under actual conditions and confirmed energy savings in all cases. As a result, we commercialized a 3 kW-class SOFC system for business use, which features a power generation efficiency of 52.0% and total efficiency of 90.0%. *1 The focus of this method is on improving heat efficiency by making the cylinder expansion ratio greater than the compression ratio through a change in the cam profile shape in order to delay the timing of valve closing, unlike the conventional Otto cycle, in which the cylinder compression ratio and expansion ratio are the same. As of March 2018, we are continuing to test a 5 kW-class commercial fuel cell installed at the Arakawa Sogo Sports Center in Tokyo’s Arakawa Ward. 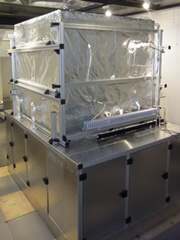 The test under actual conditions of 5 kW-class commercial fuel cells is being conducted under an agreement concluded between Arakawa and Tokyo Gas at the end of 2015. This is the first test of its kind at a public facility in Japan. Electricity generated by a commercial SOFC powers first-floor lighting at the center, while waste heat is used to produce some of the hot water for locker room showers. 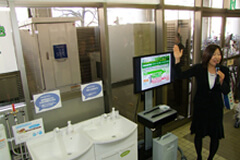 During the test, a monitor displays the amount of electricity generated by the SOFC, and visitors can experience the hot water. The project is intended to raise awareness of fuel cells and the contribution they can make to the creation of a low-carbon society. We have developed technologies to improve the efficiency of SOFC power generation and confirmed the world’s first 65%-level*2 power efficiency rate on a lower heating value (LHV) basis by a small-output, 5 kW-class fuel cell hot box. We combined three technologies—building double fuel cell stacks, recycling fuel and achieving thermal self-sustainability with unused fuel—and verified their effectiveness. With these technologies, we will accelerate research and development to build a prototype so that we can contribute to creating a low-carbon society upheld by the advanced use of city gas with a marginal impact on the environment. *2 Excluding the energy to operate the fuel cell when it is incorporated into a power generation system, and on a direct-currency transmission-end efficiency basis for use by customers; with an auxiliary loss of 6% and DC-AC inverter loss of 5%. Source: Tokyo Gas Co., Ltd. 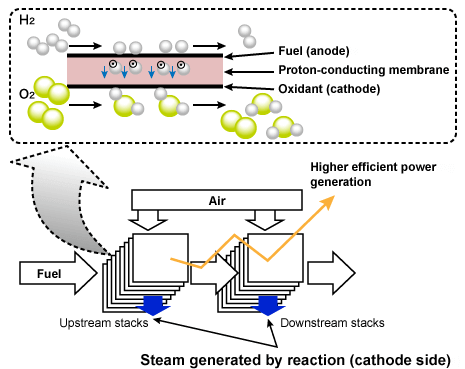 In a joint study, Kyushu University’s Next-Generation Fuel Cell Research Center (NEXT-FC) and Tokyo Gas have successfully developed an innovative concept to improve dramatically the electrical efficiency of solid oxide fuel cells (SOFCs) to over 80% on a lower heating value (LHV) basis and improving the mechanism, for the first time in the world. This achievement was published in July 2015 in Scientific Reports, Nature’s sister online publication. Super-efficient energy conversion from fossil fuel to electricity is expected to make a major contribution to reducing CO2 emissions and provide the core energy technology for creating a highly environmentally sound, smart energy society. In addition, super-efficient power generation systems are potentially far more adaptable to market demand because they produce so little waste heat during the power generation process that they can eliminate the need to use waste heat. The Tokyo Gas Group has consistently developed technologies for reducing energy consumption and CO2 emissions. However, to further bolster efforts to create a low-carbon society, we must move beyond our proprietary technologies and embrace innovative ideas and technologies from around the world. To that end, we are promoting open innovation style research and development. In fiscal 2017, we set up two specialized companies in the United States, Acario Investment One LLC and Acario Innovation LLC, and began investing in venture capital firms and venture businesses that specialize in energy technologies. We will seek closer collaboration with startup ventures and companies that have innovative business models toward meeting the demands of a low-carbon society.